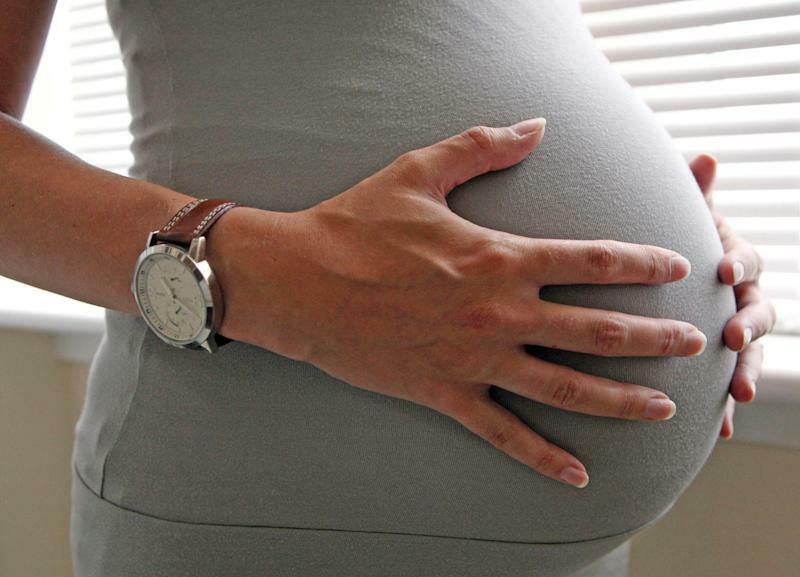 Embargoed to 0001 Tuesday September 24 File photo dated 25/06/08 of a pregnant woman as a fifth of women have not been able to get a job after taking a career break to have a child, a new study has shown. NEW YORK (Reuters Health) - For years, babies born after a pregnancy lasting 37 to 42 weeks have been considered to be on time, or "term." But a group of U.S. doctors is now separating deliveries that happen during that span in an effort to improve newborn health. "We have increasingly recognized that newborn outcomes are not uniform between 37 and 42 weeks," Dr. Jeffrey Ecker said. Babies delivered between 37 weeks and 39 weeks of pregnancy will now be considered "early term," according to the American College of Obstetricians and Gynecologists. "Full term" infants will be those born between 39 and 41 weeks. Babies born between 41 and 42 weeks of pregnancy will be thought of as "late term." Finally, those born at 42 weeks or later will still be considered "postterm." Ecker is the chair of The College's Committee on Obstetric Practice. He is also a high-risk obstetrician at Massachusetts General Hospital in Boston. "Language is important in communicating that it's not just one period of time and to recognize that outcomes do differ," he told Reuters Health. A growing body of research has found babies born before 39 weeks are not as developed as those born later. Babies born after 39 weeks have fewer poor outcomes such as breathing, hearing and learning problems, The College says in its joint statement with the Society for Maternal-Fetal Medicine. The statement was published Tuesday in Obstetrics and Gynecology. The brain grows by about a third between week 35 and week 39 of pregnancy, according to The College. And a layer of fat to help keep the body warm is added during the last weeks of pregnancy. The new definitions were created by a 2012 working group to facilitate data reporting, research and the delivery of quality healthcare. "It's not surprising," Dr. Christopher Glantz said. "I think we've been moving in this direction for a few years now." Glantz is a professor of obstetrics and gynecology at the University of Rochester School of Medicine and Dentistry in New York. He was not involved with crafting the new definitions. "I think this is good to make sure everyone is using terminology that everyone understands," Glantz told Reuters Health. "They're just saying we need better precision in our definitions," he said. "Otherwise people use ‘term' to mean all sorts of things." There's also hope the new definitions will help curb the number of women who choose to have an elective delivery for non-medical reasons. The College recommends against induced labor or cesarean section before week 39 of pregnancy. "Doctors can now say to patients that elective deliveries should not be undertaken in the ‘early term' period," said Ecker. He cautioned, however, that there are some instances when induced labor before 39 weeks is medically necessary for the mother or baby's sake. These definitions, he said, should not be seen as reasons for women to ignore their doctors' advice. "They should have a conversation together," he said. SOURCE: http://bit.ly/1ibumWD Obstetrics and Gynecology, online October 22, 2013.